Shooting Camp: The camp will consist of three 2-hour instruction periods. All work will focus on facets of shooting: getting in position to shoot, receiving, footwork for shot, proper hand and body mechanics. Three 1-Week Basketball Camps: 4 days (1 1/2 hours daily) of instruction in all aspects of individual improvement. Team Concepts: fast break, practice habits, basic team offense. Each camp will focus on similar fundamentals, but different drills, games and competitions will be done. Head basketball coach for the Gilbert High Tigers. 15 years at Gilbert High School with the last 11 years as the head coach; 2018-19 5A State Champions; 2008 - 2009 East Valley Coach of the Year; 2007 - 2008 Fiesta Region Coach of the Year; 2014-2015 Section 2 Coach of the Year. Coach Caserio grew up in Upper Michigan and attended Northern Michigan University in Marquette, Michigan. Coach is married to his wife Christy and has four children - Madison (14), Meisha (11), Crew (7) and Tripp (4). Coach Pedersen, originally from Michigan, was raised in Fountain Hills, Arizona. After winning two state titles in high school he played collegiately at Case Western University. Coach Pedersen's sister, Kayla also played collegiately at Stanford and in the WNBA. Coach Pedersen led the lady Tigers back to the semifinals this past season and has an overall record of 71-18 in his three seasons. Coach Pedersen is also a well known and successful club coach with the Arizona Elite. Gilbert High School Players … Some Tigers’ varsity basketball team members will assist the staff with the K-2 and the 3-5 camps. 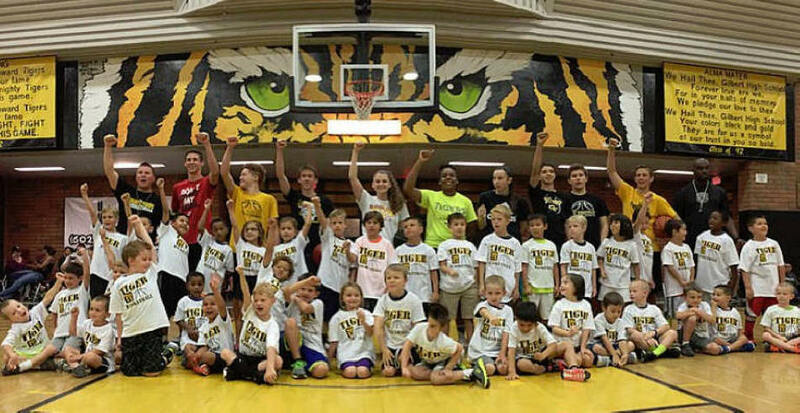 We welcome you and your child to Tiger Hoops Camps. Each session will be well-supervised and well-taught. Your son/daughter will be in a disciplined, positive, fun atmosphere. We will teach basketball fundamentals; we will also teach how to set goals, how to work well with others, and how to be a successful student and player. We will strive to make the our Hoops Camps a fun experience each morning, as we help each camper become a more skilled individual player and a more effective team player. Do Not Bring: your own ball or valuables. All incoming freshmen need to register and pay online! 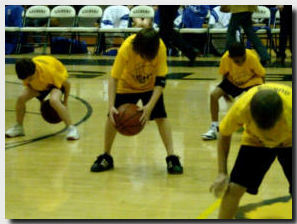 "My 9 year old and 12 year old attended the skills basketball camp at Gilbert High this summer. They both loved it and wanted to go back the following week if we weren't going out of town. They learned a bunch of skills from the coaches and Gilbert players and especially liked the team competition for candy..."
"Yesterday afternoon and at dinner all the boys could talk about was camp this week. When we went to the park to shoot hoops they were excited to show me what they learned. They loved your players who were helping during camp, saying how fun, personable and genuine they are. They loved being around you and your coaching staff. Thank-you for starting their summer off in the perfect manner...they can't wait to return to the Tigers court. 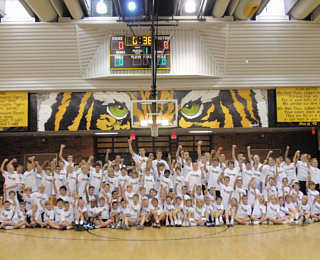 Thanks again for taking care of my boys.."
"I am thoroughly impressed with how well the Tiger Basketball Camp is run. My son has had the best time the last 2 weeks and he was pretty upset this morning that this would be his last day for the summer. He has many little friends there that played football and soccer together, and now they are planning their basketball team. Holt has had me practice with him each night the new skills that he has learned at camp. I was able to make it over there one day for a little bit and was impressed with your players being able to work with the little kids. I know a few of them from Greenfield and they have matured into outstanding young men that these kids can look up to. I think you created a Tiger fan, and I thank you for all the hard work that running the camp must take." If you sign up for two weeks of camp, excluding the shooting camp, you will get a camp basketball. One ball for the entire summer. Tiger T-shirt for all campers! Current Tiger players as counselors! NOTE: Students should be registered in the Camp for the grade level in which they will be attending next school year - 2019/20. If your son/daughter will be in 6th grade in the 2019/20 school year, register them in the appropriate 6th grade session. between Lindsay and Val Vista. PREVIOUS SHOOTING CAMP - The 2011 Shooting Camp (pictured above) was a huge success as there were close to 100 campers in the 3rd through 8th grade session. HOOPS CAMP 2009 VIDEO -To view a short video of the activities and participant comments go HERE.